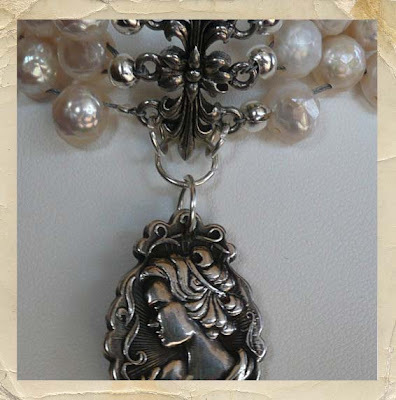 So here is a tiny peek at what I submitted to Belle Armoire. We shall see if it gets in. And yes I know...one of my bead crimp covers is missing! Arrgggghhhhhh. I was in such a hurry to get these done and out and it was a last minute idea, that I didn't realize it had fallen off until I saw this picture! So anyways, life is busy, busy, busy. Jen and I need to get it in gear to be ready for our show. It is coming up at lightening speed. Then Art Unraveled! I am looking very forward to that. Taking classes is always so much fun. Someone made a comment to me recently that it has been fun to watch me grow as an artist and that I seem to be finding my direction. But I am still unsure...I do love painting and paper and really want to do more of that. Can't I just do it all??? LOL Do you have to be limited to "just" a jewelry artist or "just" a painter? But I do have to get rid of some of my stash of beads! LOL...hence the shows that are coming up. If you are out and about, come stop by and see me. I would love to meet some of my blog commenter's! I must be off to create...Jen are you busy?????????? Ahhh! Your killing me with suspence. I can't wait to see it in its entirety. I know what you mean about just picking 1 meduim. I have a laundry list in my journal & ideas in the head all the time. I wish I could craft 24/7 or even longer! I'm gone to create as well. I've been web surfing all afternoon. AHHH is right...I want to see the whole thing!! Best of luck with your submission...came here via BEELIEVE! Oh I hear ya. Only if there was more time. I love trying to do it all. I have such a stash of papers along with the acrylic paints and such to last me a really long time. Though I love creating new jewelry pieces as well. Good Luck with your submitted piece to Belle Armoire. ooh, I love the sneak peak...and yes, you can be ALL of those things!!! You'll find your own unique way to use all of your artistic strengths and visions, I am sure! !